To request handling special cargo (break bulk, loose cargo) you must fill in the document available in this link and forward to the e-mail comercial@portonave.com.br. For delivery or removal of non-containerized cargo (loose cargo and special cases), clients, customs officers or carriers should fill in the form available in this link and ask the driver to deliver the document at the Gate at the scheduled time. To request ship and/or port change you must fill in the document available in this link and forward it using the standard subject: Transfer + Booking + Ship/Trip to the e-mail transferencia@portonave.com.br. The deadline for submitting this document is of one (1) hour prior to the deadline of the boarding vessel. The units whose deadline has been extended must also comply with this period. Transfers sent after the stipulated period (1 hour before deadline) will be disregarded. After the change of vessel has been concluded, exporters must release the units to the Foreign Trade sector before the deadline expires. For Late Arrival request (LAR), the Shipping Company must fill in the form this link and forward it to the emails planners@portonave.com.br and prontidao@portonave.com.br. In order to request the cancellation of export you should fill in the form, print on paper with the exporting company’s letterhead, which should be stamped and signed by the responsible issuer, at the gate, along with the removal slip. 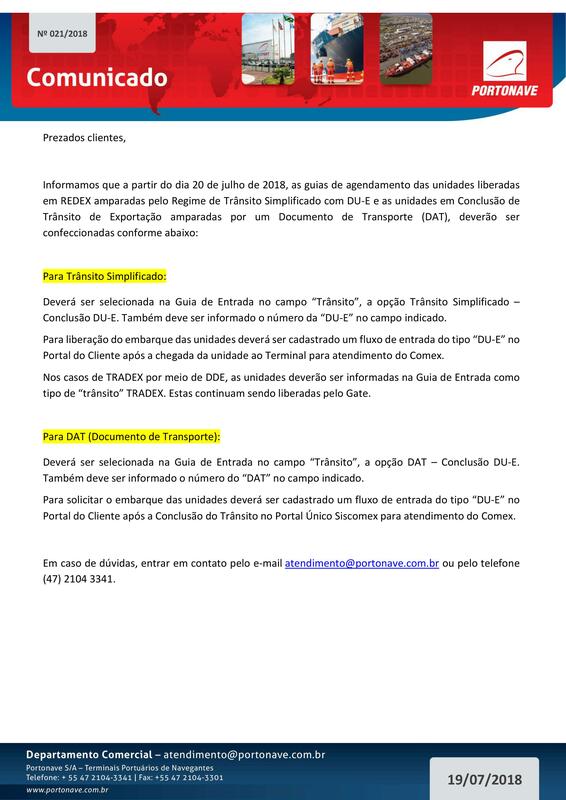 In order to request the release of the loading of ISO tank units with waste, after confirmation of the arrival of the units at the Terminal, you should fill in the form available in this link and forward it, stamped and signed by the requesting person, attached to the release request, to the email comex@portonave.com.br. For hiring the drawers rental service, the legal guardian of the contract should complete the form available in this link and forward it to the emails: faturamento@portonave.com.br and cadastrodeacesso@portonave.com.br, along with proof payment for the item 10.2 of the Price List.